When the Cleveland Cavaliers are away from #TheLand, Richard Jefferson and Channing Frye bring you along for the ride as they discuss a wide array of topics including sports, travel, music, food and more with host Allie Clifton. On this edition of RT we get an hour full of friends like the ones we have all come to love in our own Richard and Channing. Nick and Gil join RT for the first time and story time, it was. From USC to AZ comparisons, Nick failing as a hooper and in life (they said it, not us) because nick was the rook of Gil as his vet, endless Gil stories that had Swaggy out of his seat and so much more. Ever wonder what the P in "Swaggy P" stood for? Tune in and find out. I bet you would have never guessed. On this episode of Road Trippin', the Golden State Warriors duo, Quinn & Kerith are joined by Jordan Bell. Though the crew covers plenty of Championship glory - parade memories, media attention surrounding the Finals alone, etc ... they also dive into this years MVP debate, keys to guarding James Harden as the Warriors feel they have quite the defensive weapons, only time will tell - maybe?? They also dive into pre NBA life. Did you know Jordan was accused of cheating on a test in high school? He almost gave up basketball, applied for a Nike job in fact. & Quinn? Ever think you’d be learning about his love for improv? It’s all on this episode of RT. Another episode of RT brought to you by the Sacramento Kings. This Week Doug and De’Aaron are joined by Kings, Marvin Bagley. The crew talks their “Welcome to the NBA” moments, playing the Warriors, being scouted by Pop. Who is the toughest match-up Giannis or Dame Lillard. They talk Draft day memories, Coach K taking charges and diving for loose balls in practice and a whole lot more. The CLE crew is joined by John Henson and Marquese Chriss for a trip around the map, per usual. One thing is for sure, with the NCAA tournament in full swing, you’ve got a former UNC Tar heel, former Washington Huskie & of course the Arizona Wildcat diving into everything March Madness & a whole lot more. Happy Monday RT fam … for you another brand new episode, today on behalf of the Portland crew. Recently the Blazers were in LA and had a chance to catch up with ESPN’s Amin Elhassan. Variety of topics are discussed such as Amin’s pick for this years League MVP – he and Evan have two different choices. They talk the best fight in NBA History. What it’s like going from a front office position to ESPN for Amin. What seems crazier, LBJ missing the playoffs or Kobe? And not to be forgotten the moment Evan met Shaq at the age of 12. Such good insight, great stories, get to it. It’s a brand new episode of RT for you, brought to you by one of the newest members of the RT family, the Golden State Warriors. As mentioned before Mondays episode, Kerith Burke and Quinn Cook of the Warriors have joined the RT fam and on their very first episode they sit down with Houston Rockets guard Austin Rivers. The crew dives into Quinn’s NBA journey thus far, Steph Curry’s rise to stardom, the most underrated players to guard in the Association as well as if you had to guess which musical artist Coach K (from Duke) loves … yea Quinn the former Duke Blue Devil, reveals it all. The Road Trippin' fam keeps growing! On this episode, we're excited to welcome Kings star point guard, De'Aaron Fox, alongside his co-host and former Sac-Town fan favorite, Doug Christie. The two dive right into classic stories like LeBron's first NBA game against Doug's Kings team, Vlade Divac's card games and more. Plus, De'Aaron opens up about improving as a player, the trade deadline and how he never leaves home without his PS4. It's a great first episode from the boys in Sac-Town and come Thursday, we'll have the other Bay Area team joining the mix. Yup, the Warriors! Listen and stay tuned! What better way to start your day than with a fresh new episode from the CLE crew. Another opportunity to not only listen to stories told by current NBA players / idols / influencers / etc. but here is another reminder of just how evergreen and unique our platform really is. A lot like that of George Hill, Larry Sanders from a couple years back Alec Burks who spent some time in CLE wearing the wine and gold sat day with Channing J Mike and Angel just days before he was traded to the Sacramento Kings. Talking just about anything you can imagine we take this time now to flashback to Jan for some time spent with the CLE crew and this week’s episode guest, Alec Burks. This week the Portland duo is joined by the newest name Trailblazer, Enes Kanter. Several topics are discussed but the two that jump out without question: for Kanter, his inability to go anywhere ALONE due to the issues he has had with the Turkish government as well as, for those of you who are social savy you already know where this is going … can you say elevator? Ever been stuck in an elevator? I have, and so have now, many of the Blazers players. It went viral and thanks to Evan and Enes, they go in depth of just what that moment was like. Happy Monday! 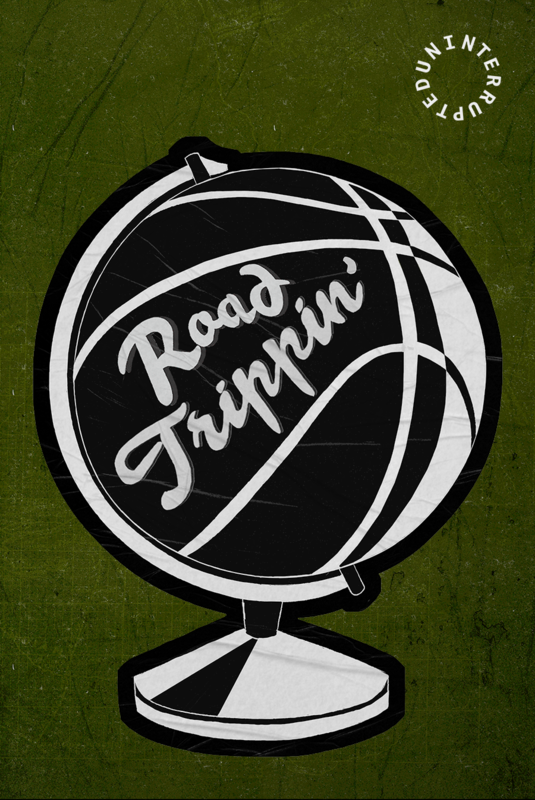 It's an episode with one of our favorite Aussie's ever, Matthew Dellavedova joins the Cleveland crew for the very first time on Road Trippin'. The crew talks Australian life, his game, food and wine preferences, as if we haven't heard enough Cleveland. The crew also delves into his performance, the overall performance of the Cavs in the 2016 playoffs, and a whole lot more. Ever wonder what it would be like to hang out on a scheduled off day, in the NBA, with your favorite players? Look no further. This episode RT fam, is FOR YOU. On a recent road trip John Michael, Angel and Channing are joined but a cast of guys from the Cavs - Tristan, Jordan Clarkson, Kevin Love & Larry Nance Jr as they cover a wide array of topics. In their opinion, who has changed the game more Curry or Harden. Speaking of the two MVP's, what is more important - season MVP or Finals MVP. Interesting one there. From hoops to books - the crew dives into their favorite books, Kev talks the latest on Mental Health and just where he is at within the process of it all ... and last but not least, our favorite: Rapid Fire Questions. Comin' in HOT and bothered, no better way to end your Monday! On this edition of RT Brooke and Evan sit down with the intelligence and creative behind all of the Portland Trailblazers social media, the voice of it all ... which in case you didn’t know, it’s not THAT easy. What are the risks and rewards, Amara explains ... if you follow Brooke on social media in fact you know exactly who the crew is joined by! Wanna know something interesting about Amara before even diving in? She is a former pro ballerina! The crew talk all that and more — What it’s like getting fined by the NBA, what Evan has done to pay back his mom for everything even a little younger childhood talk - it’s Episode 98! On this edition of RT, we're back with the Portland crew as ET and Brooke sit down with all-star Bleacher Report anchor, Taylor Rooks. After talking about who's the better spades player (hint: it's definitely not Brooke), they dive into how Taylor got to where she is in her sports media career today... it's a wild ride. The trio also debate about Chicago pizza, TV shows and weddings. Plus, you'll never guess who named their child after ET... listen to find out! On this edition of RT - we continue down the road with Jr. He talks about playing on Mamba Day with Kobe, dives into an important aspect of his life; his Chrons disease foundation and how it began. It didn’t stop there - ever have a pen pal? Larry did and never forgot about it! Channing talks being nearly being attacked by a horse, no that’s not a typo ... and a whole lot more! Happy Monday RT fam! Episode 94: Larry Nance Jr.
On this edition of RT, Larry Nance Jr. returns for what was quite the episode. It was such an episode that this is only PART 1 (Part 2 drops a week from today). Jr and the crew talk life for Larry in Wyoming & Akron. Jr is a huge soccer fan as well as a fan of video games ... like Channing. In fact Channing is such a gammer he considers himself the "Greek Freak" of the video game Overwatch. Yes, he said it. With Angel Gray on board they dive into the status and future of equality of the WNBA as well as Channing sharing his shooting story with one of the greatest of all time, Diana Taurasi. Again, its only Part 1 with this weeks guest on RT, Larry Nance Jr. The time has finally arrived …. RT has taken on yet another life of its own. It’s own TV Show. Thanks to Spectrum Sports Net & Uninterrupted – your patience, creativity and kindness to trust us at something new and different … its given us simply a chance to continue pushing forward on something we have grown to love. Tho you can still listen via podcast way (as you currently are now) just a few notes for you to remember: yes it is shown on Spectrum Sports Net here in LA, but in the next day or so we will push out a link via our social platforms, that you’ll be able to watch the show also – we will NOT leave you hanging. So stay tuned. But for now, enjoy RT how you know how. On this episode which was recorded back in September, we finally got Richard and Channing’s good friend and Head Coach of the Los Angeles Lakers to join us, Luke Walton. We talk life at the Walton’s household growing up, AZ life for both guys, the acting Luke has done in his past life as well as spent some time reminiscing about a man that meant so much to Richard and many more, Big Rich. We hope you enjoy the new ride! Happy Holidays RT Fam … on this edition we have who Channing calls “The most googled person of 2018.” Whether that is not true or not, Tristan Thompson is the lucky guest for CLE and it begins the only way Channing and TT would know how … breaking down Canadian bacon. Yes, tis true. The duo along with J Mike and Angel then are surprised by Jordan Clarkson (yet again) as they talk more NBA around the league, the state of the Cavs currently & plenty more. Like most who spent time in CLE, the guys talk how upset G Hill, a recent RT guest as well, really was when told he was headed out of #TheLand along with a round of rapid fire questions. What if anything would TT change about himself? Take a listen for yourself. On this edition of Road Trippin', Brooke and Evan are joined by the Blazers PG, the one and only Damian Lillard & they waste no time. From talking about how much their moms mean to them (shout out to all the Moms out there) S/O also to Little Leg, ET has the 4-1-1, trust me you will want to hear this. They also get into the WHY of Damian and his involvement with his anti-bullying campaign (and RT fam, LISTEN UP, this story is all too real and Dame’s mission is everything). The trio also talk about if the guys really were nervous coming into the league, how they handle social media trolls & clapping back & as if we have never talked about it before, it continues, anyone have time for some conspiracy theories? Another great episode in the books and I am excited for y'all to hear it for yourself. It wasn’t his first & wont be his last ... Jordan Clarkson aka “Bucket Getter” (Thanks Channing) stops by to join RT. It was short but sweet as he opened up on various topics. What it was like playing with the Philippines National Team this past summer, where he got his fashion sense from - who speaks to him in the middle of the night to be exact - as well as the humbling experience it was for him competing in the NBA Finals a season ago. Angel Gray, J Mike & Channing keeping it loose & entertains as always - Enjoy! I said we were BACK & back west we go …. Literally ROAD TRIPPIN ya’ll. On this episode of RT Brooke and Evan sit down with the big man for the Portland Trailblazers .. Jusuf Nurkic. Talk about someone who has truly been all over the map. Nurkic talks growing up in Bosnia and Slovenia …where he got all that height (oh hey pops), the infamous story all like & should tell, of his journey to hoops & plenty more. Enjoy! On this episode w/ (NOW) Milwaukee Bucks Guard George Hill the CLE crew takes you on a wild ride - literally. From G Hill's journey to the NBA, to delivering the Commencement speech at his alma mater last season during the ECF to his favorite extra curricular actives ... HUNTING being the main. What kind of animals does he hunt? Not what you would think. Listen and find out for yourself - in between the unexplained hilarious noises courtesy of C Frye - you're welcome. Angel Gray joins the crew as well as she shares her experiences having gone to the African Safari that G Hill is hoping to go to for the very first time this summer ... told you, it's a wild ride. What's up Road Trippin' fans! We're back and better than ever with a new version of Road Trippin' with our Portland Crew, Evan Turner and Brooke Olzendam. Their first guest is Wade Baldwin IV and the crew talks team chemistry and how the guys went to a private all-boys high school. You do not want to miss this episode. Media Day, Monday we'll call it - S/O to the NBA officially getting underway today and how ironic that this summer, Devin Harris had just committed back to The Dallas Mavericks moments before we sat down to record another edition of RT (this episode). It was a little of what we talked about, but given the fact that Richard persuaded Devin to live his off seasons in the South Bay, we found ourselves off the rails again from the Red Cup Lounge. Surprise, Surprise. We had just completed the South Bay workout as a Trio, and Channing was feeling it all ...but none the less, it made for another great episode of back and forth - the perfect one to get your week started exactly how you like; laughing. Cheers! Now this is a throwback in every stretch of the word. Not only are we throwing it back to the hour spent with Iman back in July at the UN Studios at NIKE HQ, but to have such familiarity back on one episode - it doesn’t get much better than this. From style, to tracks, babies building an empire to reminiscing of the “good ol’ days” ... need we say anymore?? Happy Monday! Time to travel back - not only was it an episode recorded back in the summer months but it was the FIRST time since LAST OCT that the trio was back together & we wasted no time! On this episode not only did we make up for lost time together but we got to know a little bit more about Charlotte Hornets' big man Bismack Biyombo, both on and off the court. From his journey thru the NBA thus far to his philanthropy off - we covered it all. What a special night it was as we flash back to an evening spent in God’s Country, at L’Angolo Estate. Thanks to The Frye Family Foundation & their commitment to The Children’s Cancer Association & willingness to give back to their community, many gathered for an evening of great laughter, fine wine & dine - all for a GREAT cause. Over the next hour plus, hear from Jacob Gray (Hospitality & Brand Director at L’Angolo) & Chase Renton (wine maker & cancer survivor) as they speak on behalf of L’Angolo Estate (anything you didn’t know about vino, now you’re covered). Andrea Corradini who serves on the board at CCA & Nike (Compelling & Inspiring). & Lastly, from two of the greatest chefs around: Peter Cho & Sam Smith (creations are to die for). Music, fine dinning & GREAT vino, again celebrating a CAUSE much bigger than life itself. Cheers! Because 1 hour spent was not enough, the crew keeps on keeping on. Memories of 2016 NBA Finals along w/ life in this day & age of social media. It may have felt like forever, but we picked up where we left off ... or at least we like to think so. YES! The trio is back together & we couldn’t be more excited - especially given the space we posted up at to record several podcasts. The Just Do It Nike HQ UNINTERRUPTED Podcast Studio is quite the place ... especially when it comes to sitting down with guests to simply just shoot the sh*t, like only we know how. On this first episode back together we are joined by ESPN’s very own Dave McMenamin to cover past, present & future life in the NBA (both on and off the floor stories). A recording that lasted around 2 hrs, has been split up into 2 parts (Part 2: next Monday) & is full of lessons, memories & plenty of laughs. SO, with that said - CHEERS! We are so glad to be back! As the Cavs gear up for the 2018 NBA Finals, we recap the battle thru the East and the story of Cleveland’s Conference Finals Game 7 unsung hero: Jeff Green. As once told here on Road Trippin, Jeff takes us thru the open heart surgery that forever changed his life & has him currently playing for his dream: a NBA Title. What a special episode we have for YOU - the one & only, “Chuckster”, “Chuck”, Charles Barkley joins us & boy does he waste no time. People always say when it comes to Chuck: what you see is what you get. Couldn’t be more honest & true. From adult beverage advice, to his stardom on the hardwood & now off - we travel all over the map for the next 90 min! His days as a youngster growing up in Alabama, the influence of the Great Moses Malone, the leagues current superstars and this seasons ROY ... fishing, pigs & what life on “Inside the NBA” is really like - be ready to laugh your tail off. Despite no wine for this edition, you learn real fast when it comes to Chuck & Richard - life, it remains the same - & so with that we say, CHEERS! With the 2017-18 NBA regular season coming to an end this week, we thought we would take a look back at the season that was, podcast style. Although it was hard to narrow it down to just our top 5, we took a stab at it and pulled our favorite moments from the podcast over the last season, that we have all grown to love. So sit back, relax, and enjoy this 'Best Of' episode of Road Trippin'! Trey Lyles makes his debut as Mason Plumlee, Paul Millsap (cameo) & Ally Sturm ride alongside Richard for another episode of RT! At the start of the NCAA tournament when this episode was recorded, the start of the Nuggets 2 week long road trip - the crew dove into everything NCAA. Kentucky, Duke & Arizona all in one room makes for a fun conversation (don’t believe me - just listen). They then get into epic and/or first hand experienced “NBA scuffles” which Channing and Trey have had one of their own ... as well as spend some time simply getting to know the Kentucky Wildcat Alum, turned NBA Pro! Is Richard a trash talker? Apparently only to his own teammates - although Clevelanders may disagree (Raptors/Cavs: Playoffs; Valanciunas anyone?) Happy Monday! On this episode of RT we take you back to the start of the Cavs most recent, longest road trip of the season where in Denver we are joined by the two former Lakers turned Cavaliers (along w/ their guest: Chucky) .. we go all over the map talking fashion, life motivations, charities, movies. We talked about the two and their return to La La Land for the first time as well as playing along side two of the Greatest to ever play. At times, LBJ who stops by, makes his cameo in the background as the conversation stays comical and insightful. Penny Wise. Chucky. Pop-eye. & more - Episode 74! We call this episode: a trip down memory lane. You will soon understand why - but here's what you need to know now. Richard & Harrison make, "real" seem easy. The two dive heavily into the 2016 NBA Finals (from both sides) and leave nothing to chance. From being on the winning side, to coming up short & the off-season that followed... this episode is enlightening. If you didn't know the connection between the two Champs themselves, you soon will & you won't be disappointed. Happy ‘International Women’s Day’. Today we take a minute to celebrate one of the greats amidst the NBA world - stretched far across the globe off the court as well. Tim Duncan took time during Episode 18 to share his thoughts on Spurs Assistant Coach Becky Hammon. A man of few words already, Tim kept is short and simple but real & raw in describing the impact & magnitude Becky Hammon has had on the NBA. A position she has earned & continues to prove, why females belong. For the first time, making his debut on RT #TeamRichard … welcome to the fam, Paul Millsap. Following his debut after missing 40+ games due to injury, Paul weighs in on his first game back, the emotions that went into it all as well as the kindness (or lack thereof) from certain teammates - bet you all would never guess. Movies, celebrity resemblances, Richard’s take on what is going on with his Alma Mater and a whole lot more. Happy Friday! Flashback Friday to that one time Devin Harris was a Dallas Maverick & the Mavs were in town to play the Denver Nuggets. At that time as Richard likes to say: To my teammate twice over. The two former teammates (at the time) along with Katy Winge catch up to talk a little bit of everything. As promised #TeamChanning ... lives on (kind of). We should probably come up with a new hashtag but none the less as #TeamRichard & Mason Plumlee said last week, “the show must go on,” .. it does/it did. King James & the one & only DJ Montage take RT to a whole new side of the map: low key chatter while playing NBA 2k & getting treatment the crew talks everything from All-Star Weekend 2018 to the new look Cavs. Respect to what had happened around the NBA trade deadline & more. What sport is LBJ taking up in his spare time & what does DJ Montage not believe in (2 things)?? ... find it all out here, NOW! #TeamRichard still going strong, as the 3 guys join Richard to talk everything that went down in the NBA at the deadline. For the Nugget fans, hear from “Money” aka Gary Harris & “Will the Thrill” for the first time in this fashion & you won’t be disappointed. Stump the Schwab anyone? Numbers worn. Richards hair style. College chatter. ... Happy Friday! The title is one you’ll soon understand. Malik Beasley joins the RT crew and he is a little on the shy side. From his love for his alma mater Florida State, the Hollywood Family he is a part of, the early NBA growth he’s gone thru - his routine, his needs... you’re in for it all. As a wife, mother, activist, actress & simply just one of the worlds most Influential women, Gabrielle keeps it 1000% real. During her book signing at Barnes & Noble: We’re Going to Need More Wine, Channing hosts an hr long chat as she opens up on anything & everything under the moon. From her motivation to writing her book, to that balance we always strive for in life. On this edition #TeamChanning sits down w/ D Rose to talk a little bit of everything. From growing up as a kid on the south side of Chicago, to playing for Coach Cal - to hobbies, his favorite vacation spots to that dunk on Goran Dragic in 2010, Derrick, keeps it real! You asked, we answered (a lil earlier tho)! Welcome to RT, Rook! One of the most unique episodes, thanks to Cedi (pronounced JEDI) we allow you a chance to get to know who he is a little more than you thought. From his rookie season in the NBA thus far, to life back home in Turkey. His favorites foods, his hobbies, his experience at Napa with the team...to even teaching us some of his language - hold your hat, it will NOT disappoint. Heads up: We DID NOT, however, get to talk about his full court pass that nearly broke the internet because this episode was recorded prior, but nonetheless, you will now understand why the team had so much fun off that play, trust! Why? Because he is Cedi; one of a kind! We've got another middle child in the Road Trippin' family - meet Mason Plumee! Duke grad, NCAA Champion ... everything Richard loves, of course! We go all over the map with "Plumdog Millionaire." Did you know he could rap? Or that he has a blog? How about his desire to not consume alcoholic beverages now with an idea their maybe a chance to pick something else up (like wine) later in life. Using his platform as a professional athlete to help create change is important to him ... he has plenty to say when it comes to life amongst rooks thru life among vets & a whole lot more. We promise you'll get your fix & if you don't, just know that when it comes to everything Mason. There is a first for everything! Cleveland Browns' star offensive lineman, Joe Thomas drops by Road Trippin' as we dive into everything you can think of with one of the best to ever wear a Browns uniform. From Badger life in Wisconsin, to hunting, fishing & manning the grill, get to know one of the best personalities on & off the field. He talks his snap streak-ending injury, Sunday weather reports from First Energy Stadium & more! ALSO (and most important): did you know that Joe has his own podcast? “The First Podcast in NFL History w/ Joe Thomas” is out on Apple Podcasts & Google Play - check him out NOW! When it comes to PB&J, it doesn’t get much better than this! Best friends, 3-time champions & future Hall of Famers, LeBron James & Dwyane Wade take on Road Trippin'. The guys open up on epic vacation stories (yes, the Banana boat), wines, Colin Kaepernick receiving the ‘Muhammad Ali: Legacy Award’, & his true impact on life outside of sport. Jameer Nelson and Richard Jefferson were two ships passing in the night as one came to Denver and the other left. Jameer comes in HOT right as the pod begins - but as you’ll see these two know what the business side is all about when it comes to the game & at the end of the day are all about respect (especially for one another). Kevin Love & Dwyane Wade drop by for more than a few good laughs. We talk Banana Republic with Kevin, ideas for Christmas baskets this holiday season & then shortly thereafter D Wade joins us. We talk endorsements - creating change as a professional athlete, those teammates that will be forever brothers, the journey of his shoe game to life in China. Oh & it's been a while, but he's back - Channing dives into a little storytelling and it will not disappoint. Anyone want to guess what D Wade and K Love have in common? Canadian born and raised, 2nd year guard Jamal Murray gets a healthy dose of #TeamRichard. From the kind of player Jamal is on the floor, dealing w/ a double hernia in his rookie season to reminders from his father - you get a great chance here to get to know a little more about Jamal. The RT crew was there to capture the launch of LeBron's newest and latest signature sneaker - the LeBron 15 at ‘The 15 Space’ Nike Pop Up Shop in downtown Cleveland. Besides making sure that this special recording with Homage went down, we had a chance to get two of the newest Cavaliers on, for some fun: Jae Crowder and Isiah Thomas. And trust us, of all the bromances the Cavs have come across, this one is definitely for the books. From a light hearted in depth talk about his love for raising his three beautiful daughters, to life on the course (who his number 1 option would be as his caddy) & when was his first tattoo - to how many he has the conversation didn't stop and Swish kept it real. From Progressive Field's outfield following the Indians 100th win of the season, Indians Manager Tito Francona and Sports Time Ohio field reporter Andre Knott join us to talk everything under the sun (literally). The Road Trippin' crew closes the summer out with jokes, stories and an ode to everyone that made the show possible this summer. When the Cavs faced the Hawks in April we sat down with Larry Sanders during a respected yet short stint with the Wine & Gold. With this opportunity came a chance for us to get to know Larry on a more personal level: his creative mind, his future visions and his life as an expert gamer. On this episode of Road Trippin' Brooklyn Nets analyst Sarah Kustok, Memphis Grizzlies analyst Brevin Knight and "Raymond" aka Marques Johnson joint the crew to talk all things ball. The summer, Road Trippin' expanded its horizons and went from the hardwood to the slopes, the ring to the stage and now they're taking on the ice. Newly retired hockey player, Matt Greene came through to discuss being a champion, his thoughts on NBA "rest" games and more. "The Money Fight" was where the action was over the weekend and that's exactly where Dr. J was, so on a quick flight to Vegas the Road Trippin' crew that came with wine, spirits and some advice for RJ. The date everyone has had The Money Fight on their calendars. So, in honor of tonight's fight we bring you a special episode with legendary boxing cutman, Stitch Duran. This week on Road Trippin', RJ had his old friend Corrine Kaplan come through and help him cohost the first ever episode that wasn't exactly about sports thanks to Lamorne Morris. For all you young aspiring volleyball players - those who love the sand & or for those who simply just love excellence, this pod is for you! Olympic standout & elite competitor April Ross joins Geeter & Richard for some RT action just days before she prepares for the 2017 Manhattan Beach Open. It's a first for Road Trippin' - and we couldn't be more pumped about this. From the national media sports world, Dave & Sarina grace RT w/ their presence but as you'll soon learn - their stories, their advice & most of all personalities couldn't be more fitting. Rookie Keynan Middleton enlightened us all on what life in the Major League is all about and Trout dives into what his favorite pro sport is and why he loves Philly. Hart gets advice from Richard Jefferson, explain what it's like to play alongside of Lonzo Ball, who his basketball idol is and a whole lot more. One week ago today the Road Trippin crew found themselves podding ... on a boat. That's right - in the Redondo Beach Harbor on the 'Body Glove' boat, thanks to The Meistrell's, the crew enjoyed laughs, plenty of stories & a lil wake at sunset. This weeks guest: JB Bickerstaff whom as you'll soon understand, goes way back w/ RJ! The baddest of all badasses, Lindsey Vonn penciled us (and you) into her hectic & very rigorous schedule to chat a little bit of everything! Everything meaning: the value of mini sewing kits as it pertains to the red carpet, Olympic doping control rules and regulations and more. Let "Big Shot Rob" catch you up on some stories you may have never heard before. From player comparisons in the NBA to his own personal memories and experiences, and stories about The Big Fundamental, Dream & the crew dive into the most recent NBA fine involving LaVar Ball & Joel Embiid. From the Angels clubhouse to pulling Jordan Clarkson away from his off season beach workout... get ready for our road trips continue! With a few months of downtime ahead of them, the Road Trippin' crew has reunited to bring you a taste of the offseason. It didn't go the way we all wanted on the court, but Road Trippin', team dinners, the camaraderie goes on & what better way to close out than be joined by The King. Episode 31: ECF .... Deron Williams joins RT! What a day - Sportscenter sits in for a Road Trippin’ recording & to our pleasure, D Will (the Original) joins in for an unfiltered hour w/ the gang. From eliminating Channing & the Wildcats in the NCAA tournament, to his LOVE for UFC & his first love in sports (and no it wasn't hoops) ... his foundation near & dear to his heart - its time to get to know Deron. Throughout the next hour not only do you get a better feel for who Deron is but the way he & the guys mesh will make you literally, LOL. ...& lucky for all of you, you can catch us today on Sportscenter and on www.espn.com. You won't want to miss what once was to now what is - thanks to YOU, our Road Trippin’ fam! Episode 30: Ron Burgundy in the building! After taking a 1-0 lead against the Celtics the Road Trippin’ crew got together to talk GAME 1, did the crew have luck chasing down Ron Burgundy, how would the guys describe the Wine & Gold & just what level of confidence does La Flama Blanca have for his team before Channing let's him in on a little secret. Episode 29: Let the ECF begin! Prior to game 1 of the ECF the Road Trippin' crew got together once the team arrived in Boston & like always - were all over the map w/ their chatter. Trucks, Jeeps, Riddles ... best college hoops atmospheres to the substitute teacher games we all played (don't act like you didn't play them yourself) - here's your Friday morning laugh at our expense! An episode that tested the patience of Allie, but was a very INSIDE LOOK at "the triangle." RJ, Channing & Kevin expose their true selves when all together & as you'll soon realize, there isn't a lot of talking rather a TON of laughing. You want real? You got real! Weight loss, team spelling bee champion, life after hoops & endless inside jokes (good luck). Enjoy! Episode 27: Will Kyrie Irving be the Lauryn Hill of the NBA? ... The Originals are BACK! On this episode the Cavs have just landed in Toronto after taking a 2-0 series lead in the ECS. Right off the bus, they got together to podcast for the first time since the IND series & thank God, because they had plenty to talk about. First 15 minutes was the RT crew along w/ Channing's good friend Kenan who dropped by (who is his GF?) as they broke down the ECS series early. Kyrie then dropped by for the next hour. Uncle Drew talked about his relationship w/ his father along with the LaVar & Lonzo Ball relationship, the crew enjoyed some yummy Canadian eats (sorry for trying to multi-task), continued to breakdown the playoffs as well as what life after hoops/careers would look like. BIG QUESTION THO: Will Kyrie be the Lauryn Hill of the NBA? Will he just decide to stop doing this before he turns 30 like that of Lauryn Hill who hasn't released a new album since winning 5 Grammy's. Only time will tell! What a great day it was in #TheLand as we delivered another LIVE edition from the Road Trippin' studios at The Q. Aired LIVE on cavs.com for all around the globe to witness, the crew broke down its perfect start to the 2017 playoffs, the fashion game of the Cavaliers as a team, best advice in starting your own podcast & how many pairs of underwear Channing packs for a quick 1 night road trip during season (yes, you read that right). Brace yourself!! HEADS UP: b/c this was a LIVE Edition and we utilized new resources to show video, we will be migrating over for certain segments, to the video podcast platform on ITunes to enhance your listening (viewing) pleasure - so stay tuned - will be posted soon!! Episode 25: #Cavs #Raptors ... Up 3-0 & It's Derby Day!! What's better than 1 Channing Frye? 2 Channing Frye's. That's right on this edition of Road Trippin, Channing's younger brother Logan & his lifelong best friend Mark join us to talk everything fashion - you'll soon understand - their own fashion ways but also the knowledge they have living in Brooklyn & simply having a great fashion sense. Can we wear white year round? Open toed shoes for women in the winter? Yeezy's. & who's the best dressed in the whole NBA? ... brace yourself & enjoy! On this edition of Road Trippin, the crew is fresh off the plane in Indianapolis up 2-0 in the series. A look back at what was, a look ahead to what could be - we talkin' Playoffs! … w/ a dose of comic relief on the side (per usual) water turtles, gold fish brains & all. Ha ha ha. It's Channing Frye's time to shine. Listen up. Road Trippin' went live for the first time and it was unforgettable. The crew's stay at the Dream Hotel would have been more dreamy if they snagged the Wedding Crasher star for the pod, but they didn't, so they discuss going live for the first time! On another edition of "Road Trippin; OT" we bring you a bond between the 3 X Champions - LeBron James & James Jones - told by Champ himself. Tim Duncan ... Who would have thought? From hobbies to tattoos, learn everything that you've ever wondered about the Spurs legend in the latest Road Trippin'. James Jones, "The Champ Is Here"
A techy, street & book smart guy, James Jones goes all in with the Road Trippin' crew and like gasoline on the fire he explodes w/ first hand experience of "The Malice at The Palace", his favorite books & plenty more! RJ and Channing break down their relationship with Josh and a whole lot more goes down on this episode of Road Trippin'. For your healthy dose of #FBF Jump Shot Jesus, & the King join in for some 2nd Half action w/ the Road Trippin crew. Swish talks about his progression in getting back to game action and the King talks business. UNCLE DREW is back ... First Half w/ "The Originals"
From 30,000ft in the air the crew dives into the "Flat Earth" (again), being uncomfortable in life (the versa climber is the devil) and more. On this edition of "Road Trippin" Channing masters the "quiet game". Allie a.k.a. "Mac Truck" reminices her days at Toledo in light of the MAC Tournament & then the 2 (w/ a dose of C Murda on the side) answer any & everything you fans want to know -- YES pineapples DO belong on pizza. King James joins the Road Trippin' crew in ATL to talk a little bit about hoops and a lot about life. Episode 11: Kent Bazemore .."You gotta ring tho!" On this edition of "Road Trippin" the crew travels thru the NBA & invite 5th year guard of the Atlanta Hawks, Kent Bazemore in for some fun. A rookie of RJ's back in 2012, the man they call "Baze" talks life in the NBA, advice he'd give to make it in the league (he was an Undrafted Rookie you know) as well as the "darkest" moment of his life & ways to give back to a foundation that is near & dear to his heart.